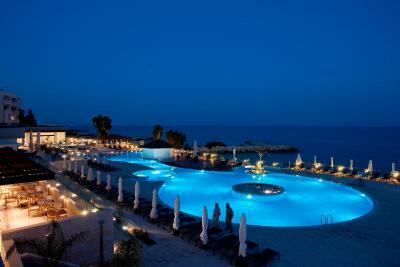 Lock in a great price for The Royal Apollonia - rated 9 by recent guests. Acceptable value for money in Limassol. The city centre is not quite within walking distance since it is in resort area, but a taxi that costs 6 euros would do. The room is comfortable, cozy and clean, although quite small. Tile flooring, good air conditioning. 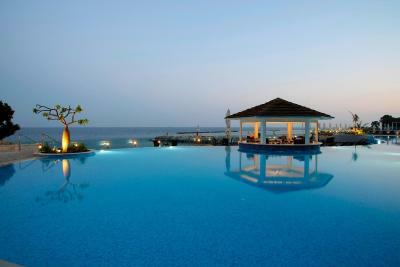 Awesome sea and pool view, very relaxing. Noise cancellation is alright. Hot and constant shower. Good wifi connection. The staff are all friendly and informative. The Apollonia Taxi Service is amazing with great comfortable cars. 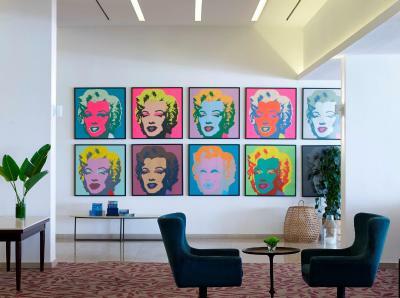 The style of the hotel is modern. 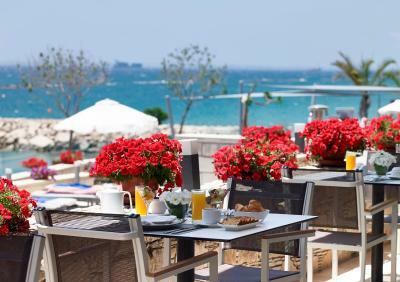 The breakfast has good variety with good dining environment and view. Room service is great as well, on top of their great restaurants. Overall a very good stay. Excellent rooms and facilities. Highly recommended!! Nice swimming pool, nice food, very effective staff. Beautiful views. We got upgraded to sea view for free. Great location. Staff warm and welcoming. Amazing breakfast and very clean hotel. Definitely coming back. Staff very polite and wellcomimg.Extra comfy bed. Excellent breakfast. Very comfort bed. Clean rooms, staff was very friendly and kind. Gave us shampagne and chocolates at check in! They have also upgraded our room with a Jacuzzi! Good size room with very sunny balcony. Large lounge space and multiple restaurants within hotel. 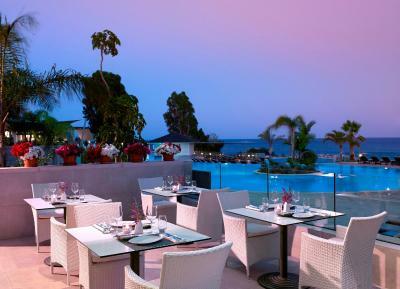 One of our top picks in Limassol.This luxury hotel is located on the beachfront of Limassol Town in Cyprus, just 3.1 miles from the archaeological site of Amathus. 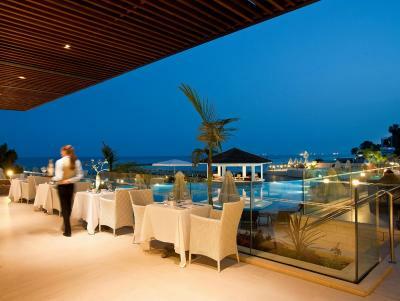 Well known for its excellent cuisine, it also has 2 floodlit tennis courts and a sauna. Rooms have balconies with views of the Troodos Mountains or the Mediterranean Sea. 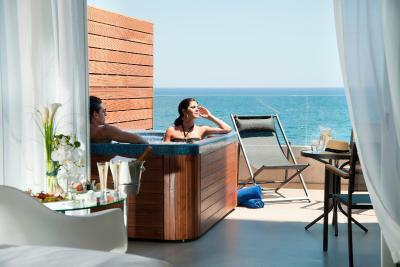 Rooms at The Royal Apollonia have modern furnishings and large floor-to-ceiling windows.They are air-conditioned from May to October and come equipped with satellite TV, tea and coffee facilities, slippers, bathrobes, hairdryer and minibar. Free WiFi is available. Free umbrellas and sun loungers are provided on the beach, while there are 3 swimming pools here; an indoor pool, a main freshwater pool of 523 m2 and a children's paddling pool with water games, which is heated form November to April. Guests can enjoy a relaxing massage or attend aerobics classes. 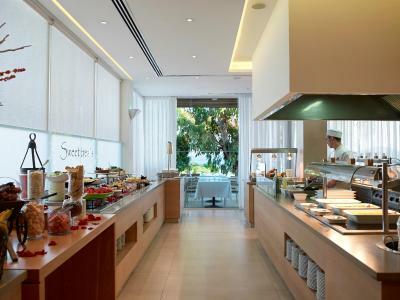 Dining options include the Japanese a la carte restaurant Akakiko, the International Dionyssos restaurant and the Meze by Elliniko restaurant. 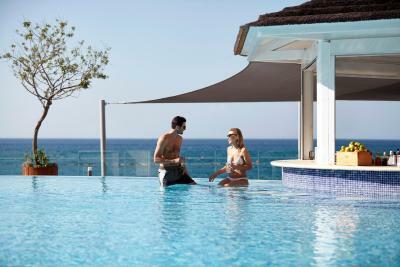 The seasonal Ocean Blue Pool Bar serves daytime snacks, drinks and cocktails, while drinks can also be enjoyed at the indoor Aphrodite Bar. The centre of Limassol is at 5 km, as well as Cyprus University of Technology. Larnaca International Airport is 42.3 miles away. The hotel provides bicycle and car rental, as well as free on-site parking. 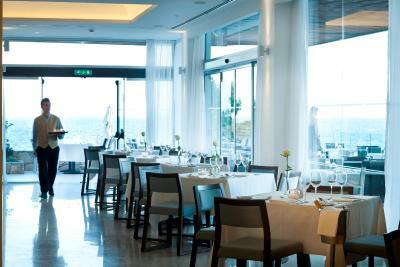 The Royal Apollonia has been welcoming Booking.com guests since 7 Sept 2010. 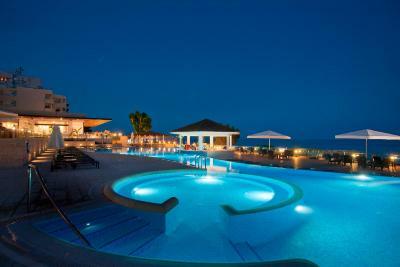 When would you like to stay at The Royal Apollonia? This room has a private furnished balcony and views of the Troodos Mountains. Free WiFi is available. Please note that the 3rd guest is accommodated in an extra bed. This room has a private furnished balcony and panoramic views of the Mediterranean Sea. Free WiFi is available. This room has sea view, a private outdoor hot tub and sunbathing area. Free WiFi is available. This suite has a balcony, bathrobe and air conditioning. Free WiFi is available. This room features a balcony, bathrobe and minibar. Free WiFi is available. Please note that the 2 children (up to 12 years old) will be accommodated in 2 camp beds. 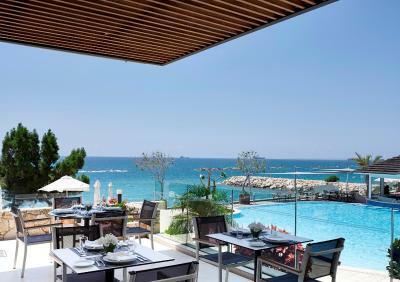 Named after Apollon, the ancient God of light and the sun, The Royal Apollonia beach hotel in Limassol, Cyprus has opened its doors after a complete and truly majestic renovation that led to the rebirth of Limassol’s very first 5-star hotel. Hotel surroundings – This neighbourhood is a great choice for travellers interested in nightlife, beaches and friendly locals – Check location Excellent location - show map Guests loved walking around the neighbourhood! House rules The Royal Apollonia takes special requests - add in the next step! The Royal Apollonia accepts these cards and reserves the right to temporarily hold an amount prior to arrival. Please note that the hotel requires the guest to present the credit card used for reservation upon check-in. Please note that the Spa operates from 8:00 - 20:30. The hotel will be sending a secure payment link for immediate payment of non-refundable reservations. Please note that guests will receive a form for online check-in after booking. Kindly note that in Dionyssos restaurant men are required to wear long trousers at dinner. Please note that the Ocean Blue bar only operates during the summer months. The spa area is quite crowded. Soundproofing could be a bit better. I could hear everything outside my room and from the near by rooms. Housekeeping came in twice while we were sleeping. Better lighting in the bathroom. The Spa! Great service, kind staff, good deals. Upon arrival we were surprised with an upgrade. The breakfast buffet was very nice. Totally recommend and would stay there again. Old and ugly rooms. Poor quality. Overpriced for what you are getting.